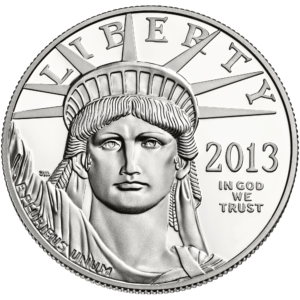 One ounce American Eagle Platinum Proof Coins for collectors have a very limited minting. Produced at the United States Mint at West Point, they feature the "W" mint mark. American Eagle Platinum proof coins are packaged in a custom-designed portfolio presentation case. American Eagle Proof Coins undergo a specialized minting process, which begins by manually feeding burnished coin blanks into presses fitted with special dies. The coin is struck multiple times so the softly frosted, yet detailed images seem to float above a mirror-like field giving them a cameo type appearance. After scrutiny by white gloved inspectors, each American Eagle Platinum Coin is sealed in a protective plastic capsule and mounted in a handsome satin-lined velvet presentation case with its own official Certificate of Authenticity. Since American Eagle Proof Coins are produced by the United States Mint, each coin's content, weight and purity are guaranteed by the United States Government. American Eagle Platinum Proof Coins have very limited mintings.